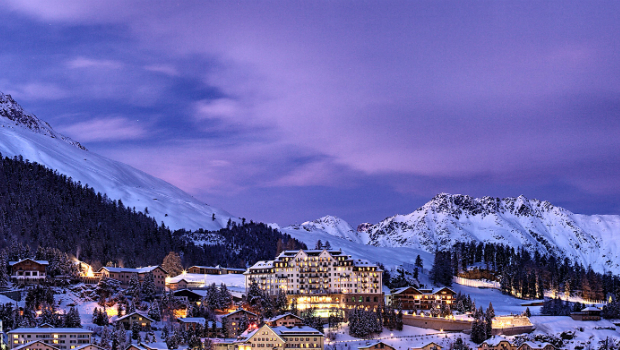 St Moritz has been the birthplace of Alpine tourism and Switzerland’s prime winter destination since 1864. This renowned ski resort first became famous for its mineral springs discovered 3000 years ago and it was established as a summer spa destination. Today, St Moritz is a synonym for a glamorous, vibrant and chic town, second home to the celebrities and millionaires during the winter season. What truly makes St Moritz a winter wonderland are the outdoors. The extensive and perfectly groomed slopes are dream paradise for skiers and snowboarders, so there’s no wonder that alpine skiing history started here. St Moritz hosted two Winter Olympics (in 1928 and 1948) and the first Snowboard World Championship in Europe took place here in 1987. The nearest airport is Zurich airport, located around 200 km from St Moritz. It is well connected to the ski resorts via public transport, coach service and taxis. The preferable public transport option would be the train, but it is a long journey which may take up to 3-4 hours. The fastest and most convenient way would be to arrange private airport transfer from Zurich airport prior to your trip. The service includes a door-to-door transfer in comfortable cars, minibuses or if you’re a larger group, you can book a bus. Spread over 350 km of the ski area with 88 individual pistes and 24 ski lifts, St. Moritz is one of the largest ski resorts in Switzerland and winter paradise for intermediate and expert skiers. The pistes are located high above 2500 metres which makes them perfect for skiing and snowboarding during the season. There are three separate ski areas in St Moritz with various slopes and different characteristics. Corviglia pistes are extensive and impeccably groomed, great choice for intermediate skiers. The Corvatsch ski area provides the longest slope (9 km) for night skiing in Switzerland, while the Diavolezza has the steepest slopes across the glacier. If you think that getting to the top of the mountain is too mainstream, in St Moritz you can fly to the top of the piste and enjoy your ski ride down the hill. The aquamarine water of the Lake of St Moritz turns into ice each winter and becomes an interesting setting for winter sports events. The White Turf races, held in February every year, are the most daring horse races which test the courage of the competitors. The most exciting is the Skikjöring race, which is one of its kinds in the world and exclusive to White Turf, where men on skis are pulled by unsaddled thoroughbreds. Take a break from skiing and spend a few hours learning the local history. The Engadine Museum is a perfect place to spend some time exploring the historical heritage of this region. It is set in a replica house from the early 18th century and it displays authentic furniture, various fabrics, costumes and textiles characteristic for this region. Some of the ancient artefacts date back to the Bronze Age. The founder of the museum, Richard Campbell, was a collector of furniture and houseware from Engadine, so he decided to build a house in Engadine style and open a museum. If you’re looking adrenaline boost experience, then you should try bobsleighing on the St. Moritz – Celerina Bobsled Run. This is the oldest bobsled run in Switzerland, opened in 1890, and the only natural ice run in the world. It is rebuilt every year starting from the last week of November and it takes three weeks to build the 1722 meters long track by hand from natural ice. Training runs and races are usually held in the morning until noon and if you’re a fan of this sport, you can attend one. The best thing is that the run is open to the public so if you want to have a wild ride with 80 miles per hour, this once in a lifetime experience will cost you around 250 CHF. You must remember the little orphan girl Heidi from the book written by Swiss author Johanna Spyri. The movie which made the book even more popular was filmed in Engadine and the hut that was used during the shooting of the movie is one of the most visited attractions in St Moritz. It will be a great opportunity to take your kids and see the grandfather’s hut where Heidi spent her time. One of the most famous railways in the world runs from St Moritz to Zermatt. The Glacier Express is an iconic mountain rail journey which takes seven hours during daylight through the most breathtaking mountain landscapes. It is considered to be the slowest railway, but this gives you the opportunity to enjoy the magnificent view crossing over 290 bridges and through 90 tunnels.